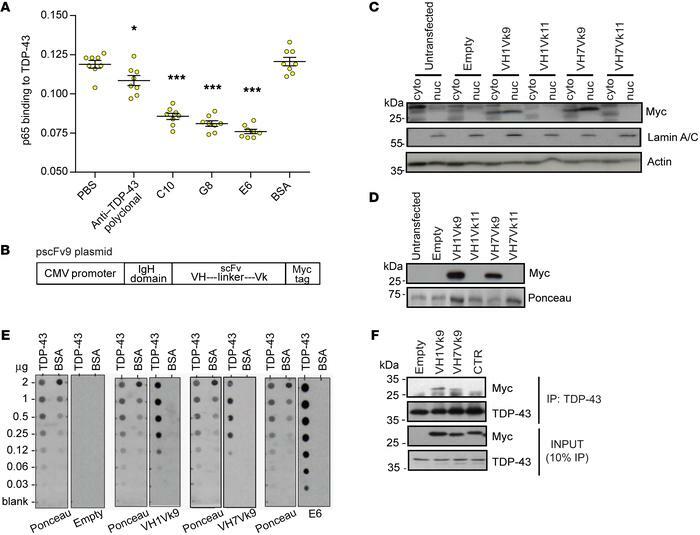 E6-derived scFv antibodies are able to recognize TDP-43. (A) Binding of p65 to TDP-43 was measured in the presence of PBS or anti–TDP-43 N-terminal antibody (Proteintech), monoclonal antibodies against RRM1 TDP-43 (named C10, G8, and E6), or BSA. n = 8 wells per condition (dots). One-way ANOVA P < 0.0001; *P < 0.05 and ***P < 0.001 versus PBS, by Tukey’s multiple comparisons test. Data represent the mean ± SEM. (B) Schematic representation of the pscFv9 plasmid used for scFv production and expression. (C) Representative Western blot of cytoplasmic and nuclear fractions of Hek293 cells. Anti-Myc antibody revealed scFv and laminin A/C or actin in the different fractions. (D) Representative image of media from transfected Hek293 cells probed with anti-Myc antibody. Ponceau staining was used as a reference. (E) Different concentrations of TDP-43 (1–206 aa, Proteintech) or BSA were loaded onto a dot blot membrane. Immunoblots were performed with media containing pscFv9-transfected Hek293 cells and E6 monoclonal antibody. Signals were revealed with anti–Myc-HRP antibody for scFv conditions or anti–mouse HRP for E6. Ponceau staining was used as a reference. (F) Representative blot of TDP-43 immunoprecipitation in pscFv9-transfected Hek293 cells. Experiments in C, D, and F were conducted more than 3 times. Empty, no scFv; CTR, control D1.3 scFv.